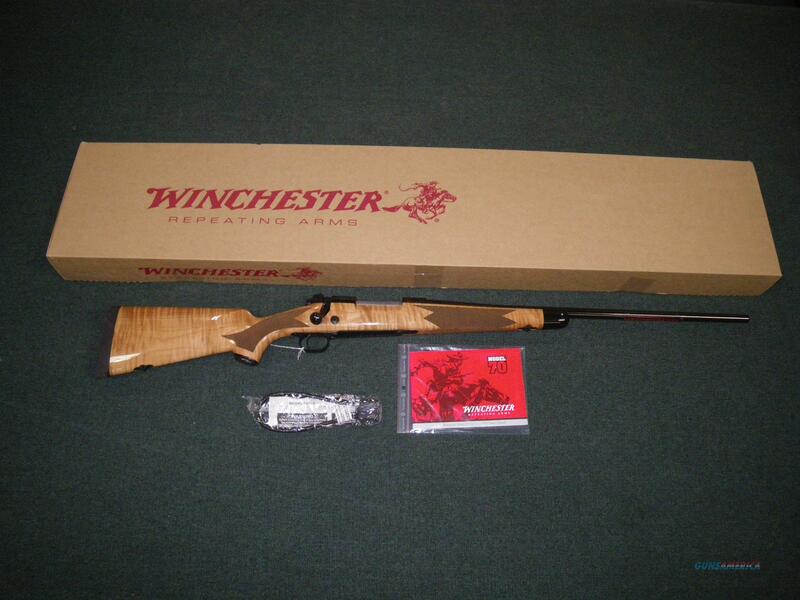 Description: You are bidding on a new Winchester Model 70 Super Grade Maple in 30-06 Springfield with a 24" barrel. Sweeter than maple syrup. And that is pretty sweet. The look of a Model 70 with a AAA Maple stock, embellished with classic ebony tip, along with a shadowline cheekpiece is hard to resist. Maple may seem retro to some, but this is beyond retro -- is ther such thing a neo retro? It looks better than any Maple-stocked rifle before. Take it to the range and get the surprise of your life. You will be surrounded with admirers. But it is not just a show gun, it shoots very, very well. With its M.O.A. trigger system and solid Pre-64 action it is a tack driver that can take tough hunting in stride. You have wanted one of these for a long time. Put one on your list and make it happen. Displayed images are stock photos. Any questions please feel free to ask (our phone number is in the additional information tab above).